Shelby Farms Park is home to a thriving herd of buffalo (American bison)! There are usually around 15 buffalo roaming the Park each year. The number of buffalo fluctuates as calves are born each spring. The buffalo range is over 50 acres, which gives our herd plenty of room to roam and graze. 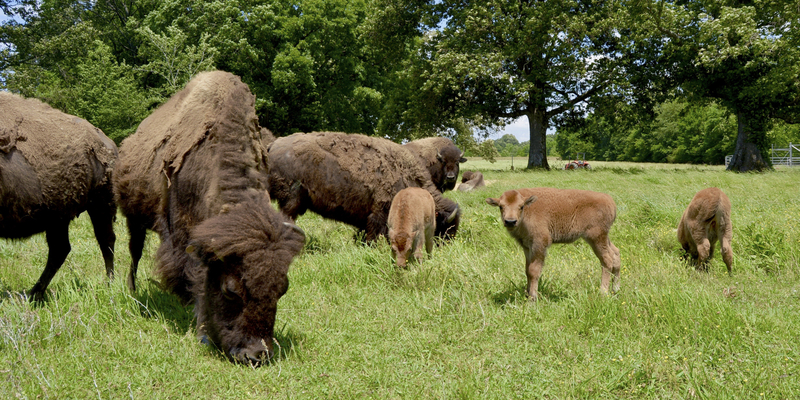 The Shelby Farms Park buffalo herd is cared for by Park Rangers and by large animal veterinarians. This hardworking team makes sure that the herd’s diet is naturally supplemented and that they are cared for every day. Why does Shelby Farms Park have a buffalo herd? Buffalo played an integral role in the ecological and cultural history of the United States, but for a long time, herds across the country were dwindling in size and number. Conservation efforts were launched throughout the country to help restore the once thriving buffalo populations. Prior to the foundation of Shelby Farms Park Conservancy in 2007, Shelby County Government managed the land. In 1989, the Park’s superintendent, Tommy Hill, brought six buffalo to the Park, and they have called the Park “home” ever since! The herd has grown over the years, and in 2013, SFPC built a new, specially designed range for the buffalo that features a self-filling water trough, hearty native grasses and plenty of shade for hot summer days. how does the park take care of all those buffalo? Caring for these iconic animals is a big job! Our herd consumes 50,000 pounds of hay and supplemental feed each year, and they can drink up to 30 gallons of water per day. Our Park Rangers dedicate 1,000 hours to caring for the buffalo each year, and periodically bring veterinarians to the Park to make sure the herd is in tip top shape. how can you help support the buffalo? You can help provide care and support for the herd by adopting a buffalo, or by making a donation to our Feed the Herd program.